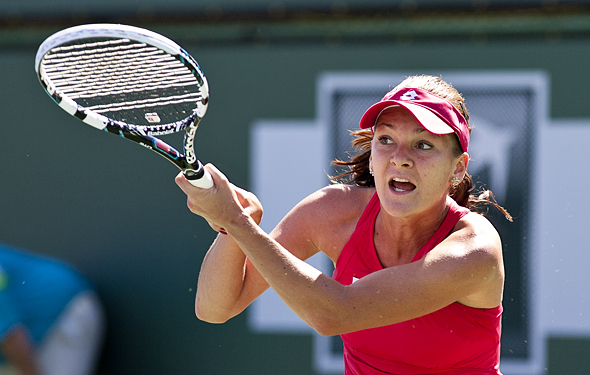 Aga will have to battle on center stage. This going to be a long three sets. Both can run forever and both can be very patient. Yes they can both find the lines. But, if the Pole can spin the balls around her and confuse her, Radwanska will win. If the lefty Lepchenko can bang her forehand, she can pull off the upset. Varvara will be very close, but Radwanska will throw in some beautiful drops and win 7-6 in the third. The Ukrainian Svitolina has not only grown stronger and faster but she is more composed now. But while she thinks she is ready to shock the world, Williams already looks very good and ready to rumble. Svitolina might bew improvving, but she will only able to win seven games or so. This could be a lot of fun amongst these two, as the Swiss can hit his one-handed backhand with a yo-yo while the Finn can twist his left-handed on the lines. The veteran can trouble Wawrinka, but Stan truly believes that he can go back to back at the Australia and against Jarrko he will win in four sets. Remember when Verdasco made it into the semis and nearly stunned Rafa Nadal but then he fell short in more than four hours? Verdasco can bang his forehand, but his backhand us so-so and he isn’t ultra fast. Fernando will have a ton of fun for about an hour and a half, but Djokovic will out nerve him and win in four sets. The tall and super strong Czech thinks she can win the tournament and she knows it. She whips her first serve, her left hand is dangerous and her volleys are more effective. But the 19-year-old Keys is coming hard, too. She can blast her first serve at 120 MPH, she can gun off her forehand and backhand and she is put away balls at the net. But Keys is still a little young, while Kvitova is more mature now. She will win in two straights sets. 18-Venus Williams is steadier than Carmila Giorgi. Jerzy Janowicz will upset Feliciano in five sets – again. Victoria Azarenka is ready to go deep and will thrash over Barbara Strycova. David Ferrer will last forever to best Gilles Simon. Milos Raonic has to work harder to get to Rod Laver and will do so to blast Benjamin Becker. CoCo Vandeweghe has a huge serve and will take down Madison Brengle in three sets, but it will be super close. Kei Nishikori wants to be on Laver, but Hisense is packing in tons of Japanese fans this week. Steve Johnson is getting and better and will bring it to five sets, but Nishikori will triumph.